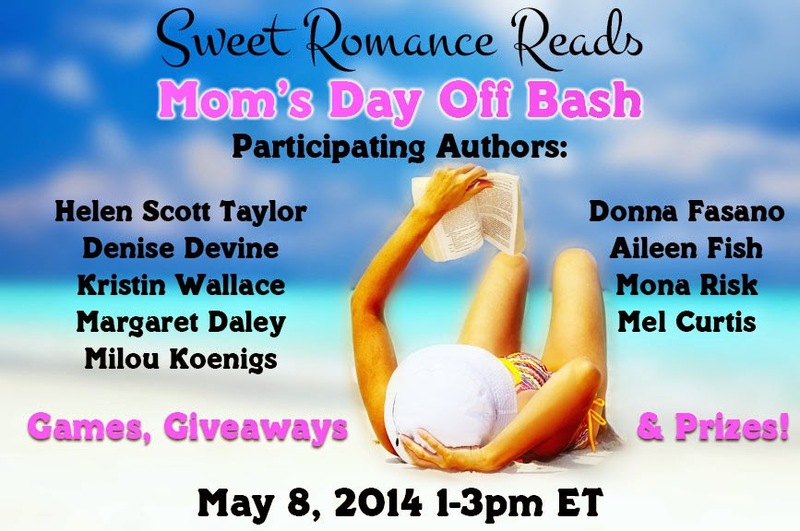 Sweet Romance Reads: Another Fun Event! Thank you to all the authors and readers who joined together for our Mom's Day Off Bash FaceBook Party on the Sweet Romance Reads Group FB Page. It was a huge success with many wonderful answers and comments left on the games and book posts. Many ebooks and gift cards were given in prizes and here is a list of the winners. Special Moms: 5 Amazon Gift Card offered by Margaret Daley to JENNIFER SNOW. A copy of Love Gone to the Dogs offered by Margaret Daley. The book was FREE on Thursday. Anyone can grab a copy. A copy of Reclaiming Home offered by Milou Koenings to LINDA QUICK. Mother's Day Traditions: $5 Amazon Gift Card offered by Donna Fasano to CHRISTINE DUNKIN . Mother/Daughter Activity: Mona Risk will award a copy of Holiday Babies Series to KATRINA EPPERSON. We have more FaceBook parties coming up during the year and look forward to seeing you all there for a few hours of escapism, with the usual prizes, games and party favors on offer.